This is how effectively the NFL has skewed the culture: This week the New York Times' obit page featured the headline "Chuck Muncie, Troubled NFL Star, Dies at 60." He'd had a heart attack. But it should have read, "Chuck Muncie, Exemplar of Redemption, Dies at 60," because Muncie hadn't been troubled (read: "drugs") in more than two decades, during which time he saved lives, counseling and helping troubled kids do everything from finding health insurance to kicking blow to removing gang tattoos. His Boys and Girls' Clubs won awards. His foundation buoys at-risk kids. His counseling at Cal-Berkeley, where he'd starred, no doubt saved some football careers. But the Times' obit's headline writer chose to accentuate the obvious hook, and this is wrong. Through the oddest of circumstances, Chuck Muncie's habit saved my life one day in 1982, and I'd long wanted to find him and tell him the story of how that happened. I never did. So I tell it now in the small hope that, in death, his legacy might keep growing, despite headlines which want to stereotype him into eternity. 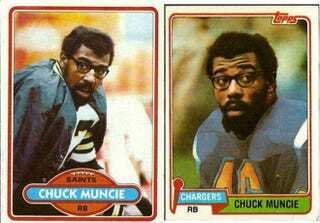 So that the name "Chuck Muncie" isn't forever followed on Google with the words "drug" and "troubled." So that one day maybe a man's life isn't judged by his performance in the National Football League, but by his character throughout his lifetime.